The NUCATS Institute is an integral link in Northwestern University’s clinical and translational research enterprise, accelerating translational innovation by providing research teams with consultative resources and expertise. The Institute is a member of the Clinical and Translational Science Award (CTSA) consortium, an initiative led by the NIH. The growth in the prevalence and productivity of “team science”—science conducted in teams—has made investigations of the mechanisms of effective teamwork and collaboration increasingly relevant (Fiore, 2008; Olson, Zimmerman, & Bos, 2008; Stokols, Hall, Taylor, & Moser, 2008). Knowledge accrual and the rise of complexity within many disciplines call for specialization as well as integration of expertise, making group work a necessity (Guimera, Uzzi, Spiro, & Amaral, 2005). This leads to the “group-staffing riddle” (Huber & Lewis, 2010, p. 22-23): how to staff or assembly a group to obtain both (1) high productivity based on diversity of expertise and cognitive models and (2) smooth coordination and communication among group members with shared cognitive models. Further, the success of a scientific team project is known to be a function of a number of team assembly factors, such as group size, diversity, and past collaboration patterns (Acedo, Barroso, Rocha, & Galán, 2006; Guimera, et al., 2005; Katz & Lazer, 2003). For instance, affiliation diversity was found to be positively related to group innovativeness in nanoscientific teams, but such a positive relationship was negatively moderated by repeat collaboration among team members (M. Huang, Huang, et al., 2010). The Multi-theoretical Multilevel (MTML) perspective (Contractor, Wasserman, & Faust, 2006; Monge & Contractor, 2003) provided a framework to compare and integrate diverse theories and to increase the explanatory power of research efforts, which is a promising way to streamline multiple potentially relevant mechanisms in scientific team assembly. 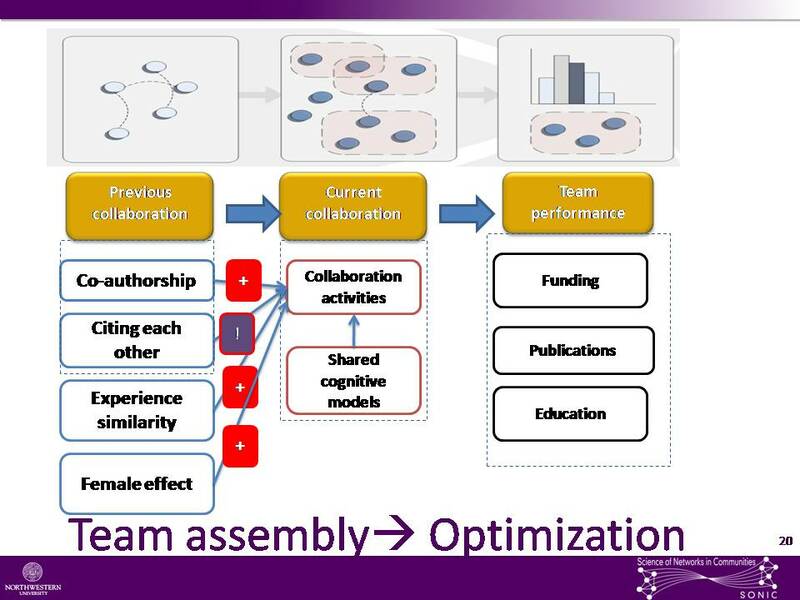 We thus propose a multi-theoretical multilevel model of scientific team assembly by exploring the potential multiple “building blocks” as well as their interactions at the individual- and group-level of analysis to explain (1) what brings team members into joint efforts in a research team and (2) how team assembly affects team outcomes. We base our hypotheses on theories such as social capital, transactive memory, collective action, homophily, inertia, proximity, and social contagion, which have been applied to previous work in work group communication and knowledge management (e.g., M. Huang, Barbour, Su, & Contractor, 2010; Su, Huang, & Contractor, in press; Yuan, Fulk, & Monge, 2007). Modeling two levels of analysis accurately captures the structure in work teams, where group members are embedded in current and previous collaboration teams and both individual attributes (e.g., social capital, expertise, and leadership) and group contextual factors (e.g. transactive memory) are likely to influence team outcomes. We have completed our survey efforts for Round 1 and Round 2 of the CTSA pilot grant competitions. Currently, we are in the stage to launch another survey to look into the participating teams for the 3rd Round of CTSA pilot grant competition as well as the Dixon competitions. The surveys request information regarding communication methods, motivation, etc. that encouraged collaboration between participants. These surveys will allow us to look into team assembly mechanisms that may be essential to creation of successful teams. The CTSA-funded NUCATS Institute is the home base for clinical and translational science at Northwestern University and its clinical affiliates and provides the infrastructure, services, and resources for maximizing and leveraging interdisciplinary “bench to bedside” research.